It isn’t Mardi Gras yet, and the Super Bowl is still a week away, but I’m in the mood for some spicy, smokey jambalaya! There’s nothing like spicy cayenne and red pepper to clear your head of any winter sniffles and with the chilly weather here, we can all use something hot and spicy. I picked up some NC shrimp and fish at Locals Seafood this week as well as some andouille sausage from Mae Farm. We are using our frozen tomatoes and peppers, homemade chicken stock and our own homemade cajun seasoning. The end result? Yum-a-licious! And enough food to feed us during a busy week! 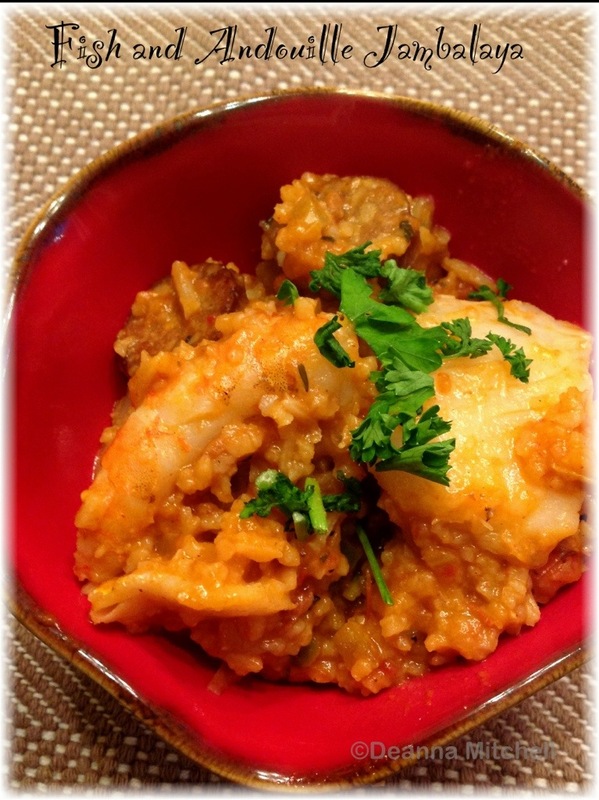 I had never made jambalaya with fish before–it tastes a lot like spicy cioppino, if you’ve ever had that. Ellie wasn’t fond of the seafood, so next time, I may try just chicken and andouille sausage, but Tom and I liked it as is! Which is good, because we have a ton of it! In a small bowl, mix all ingredients together. Set aside. In a large stock pot, melt butter over medium heat. When foam has subsided, add the sausage and cook until browned, 3-5 minutes. Remove sausage and set aside. Add onion, celery/fennel, and green/red peppers to the pot and cook until onion is soft–about 5 minutes. Add garlic and cook, stirring frequently, for 1 minute. Be careful not to let garlic scorch. Add tomato paste and return sausage to the pot. Stir well to combine. Add the tomatoes and spice mix. Stir again and cook about 15 minutes. Add chicken broth to the pot and stir well. Raise heat to medium/high and bring to a boil. Add rice to the pot, stir well to combine. Cover and reduce heat to low. Cook for 25 minutes. Add seafood to the pot, increase the heat to medium/high and bring to a boil. Reduce heat to medium and continue cooking for about 15 more minutes–longer if your mixture is too soupy. It should be thick. Season with salt and pepper (if necessary) and plate your jambalaya into bowls. Sprinkle with parsely and serve! Pingback: From the Heart – A Southern Staple – Jambalaya! | My Life. One Story at a Time.